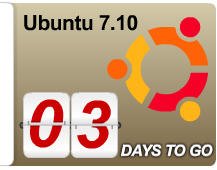 3 days to Ubuntumania! : Approximately three days from now, the final release version of the ever popular Ubuntu Linux Distribution codenamed "Gutsy Gibbon" will be unleashed to the world. I saw plenty of blogs putting the countdown image on their site in support for their most-loved desktop operating system. I have never seen an anticipation this big for a distro release. It seems like Ubuntu is always finding ways to excite the public, release after every release. They always bring something new and something good for Linux. * Compiz Fusion: This innovative compositing window manager enables 3-D desktop effects that let users work with, and see, their desktops in completely new ways. * Printer installation: In GNOME, printers are automatically configured for use as soon as they are connected. * Free Flash support with Gnash: Ubuntu 7.10 leads the pack with a preview of this Flash browser plugin. Although still actively in development and not yet fully supported by Ubuntu, Gnash gives a glimpse into the future of free Flash, bringing partial Flash support to 64-bit desktop systems. * Automated Firefox plugin installation: Beyond the addition of Gnash, Firefox in Ubuntu now supports automatic installation of popular plugins through the standard Ubuntu package repositories, for a richer web-browsing experience with the integrated security support of the rest of the Ubuntu system. * AppArmor: This easy-to-deploy kernel technology limits the resources an application is allowed to access and can be used to provide an added layer of protection against undiscovered security vulnerabilities in applications. * Pre-configured installation options: Mail Server, Print Server, Database Server, and File Server options join existing LAMP and DNS options for pre-configured installations, easing the deployment of common server configurations. With just 3 days to go before the server-clogging release, I have several lingering questions on my mind that are waiting for answers. Will it reclaim the number 1 spot from PCLinuxOS in Distrowatch.com ranking? Will it attract another ‘Big Computer Maker' like it had with Dell? Will it be a worthy upgrade to Feisty Fawn? Will it bring more Windows users to Linux? in your dreams!, maybe (some never learn), that's not much to say, God forbid!